View More In Thunderbolt Cables. Thunderbolt 3/USB-C passive connecting cable. High-performance cable for reliable connections between your Thunderbolt 3 or USB-C devices. This premium Thunderbolt 3 (40Gb/s) USB-C cable is built to the highest standards to power and connect your Thunderbolt and USB-C devices. Reversible USB-C connector, Connect to high-performance Thunderbolt 3 devices with up to 40Gb/s throughput. Connect USB-C devices with speeds up to 10Gb/s. Expand your desktop with support for up to 5K resolution displays, Power your laptop, Thunderbolt 3, or USB-C device up to 60W. Product Specifications: Connector: Type-C; Power rating: #A, 60W power delivery, 15W bus delivery; Cable Bandwidth: 40Gbps; Cable design: passive; Supports: Thunderbolt up to 40Gbps, USB up to 10 Gbps, native display port. OWC Premium Thunderbolt 3 cables are the perfect choice for extreme performance workflows. Manufactured to the highest standards to deliver the incredible power of Thunderbolt 3 technology, and with models supporting data transfer speeds up to 40Gb/s and power delivery up to 60W. That's enough throughput to drive two 4K displays simultaneously, or one 5K display. Experience the full high-performance capabilities of your Thunderbolt 3 and USB-C devices. 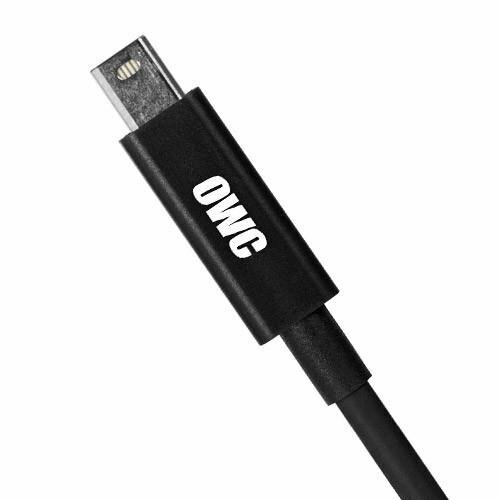 OWC Thunderbolt 3 cables are available in models supporting data speeds up to 40Gb/s. That's twice as fast as Thunderbolt 2 and four times faster than USB 3.1 Gen 2.OWC Thunderbolt 3 Cables support up to 60W of power delivery for Thunderbolt 3 and USB-C devices including laptops, tablets, phones, external storage, and more.Connect your USB-C devices, including external drives, adapters, and expansion docks.Connect a Thunderbolt display up to 5K resolution, or two 4K displays for increased desktop real estate, video editing, graphic design, and more. High-performance Thunderbolt 3/USB-C passive connecting cable for reliable connections between your Thunderbolt 3 or USB-C devices.